Designed as the perfect match, this elegant bridal set is made to make your romantic journey unforgettable. Crafted in contemporary 9ct white gold, the wedding band is channel set with sparkling diamonds, complemented by an engagement ring featuring an illusion set centre stone. 9ct White Gold 1/3ct Diamond Illusion Set Bridal Set is rated 5.0 out of 5 by 3. 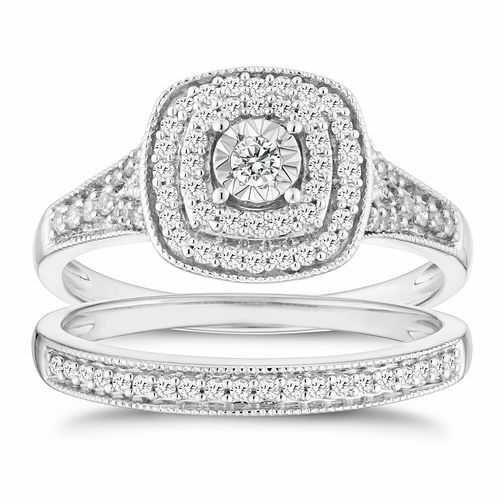 Rated 5 out of 5 by Anonymous from Beautiful wedding ring I choose this ring set for my wedding in September this year. It’s unusual and stands out. Very sparkly and always get compliments on it.